I got up a bit earlier this morning to have breakfast with a couple of friends and then slip in to church. 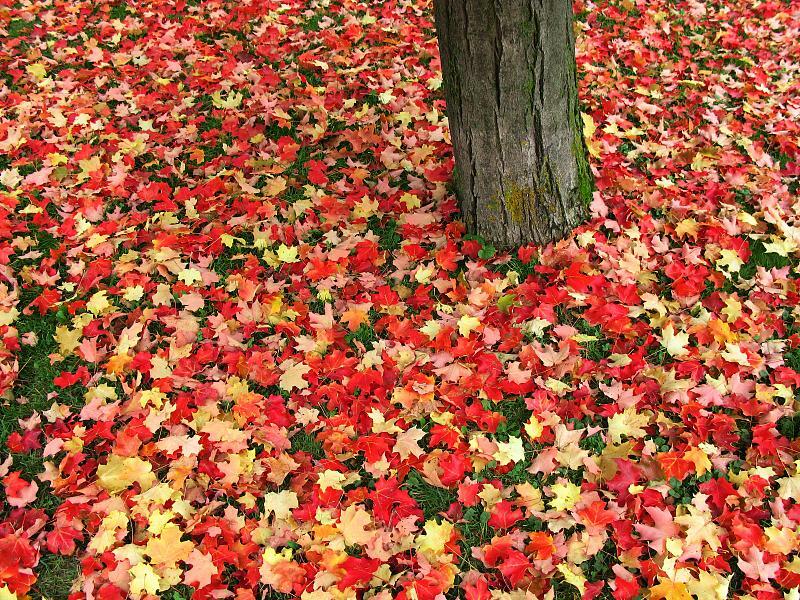 After the service I went for a brief stroll to visit this pile of bright red leaves at the base of a nearby maple tree (I had spotted them on the way in to the parking lot). This part of the world is blessed most years with a brilliant display of fall colours. The still-mild days, coupled with the chilly nights, seem to bring out the best in the hardwood trees of the Ottawa Valley. Gatineau Park, just a few minutes away, is renowned for its colours and attracts thousands of people each year at this time. The display usually peaks around the Canadian Thanksgiving weekend, when traffic and parking control become necessary. The park is there to be enjoyed, but it can be disheartening to see the hordes tramping down vegetation and idling the engines of their road whales. The fall colours and the invading vandals bring another challenge: with all those shutters clicking in front of similar patches of foliage, is it still possible to say anything fresh or interesting? I continue to hope so -- because the leaves are just too great an invitation to pass up.